Barbeque in the backyard or walk two minutes to the beach. Choose from three cottages for intimate getaways or family vacations. Visit Rockports art galleries, boutiques and seafood restaurants. Indoor activities such as board games, HDTVs and free wireless internet. If you are in need of a pet friendly rental in Rockport for the summer, look no further. The Cottages at Rockport are wonderful places to stay during your vacation in New England. Each cottage is carefully maintained to be as charming and restful as the scenery surrounding them. 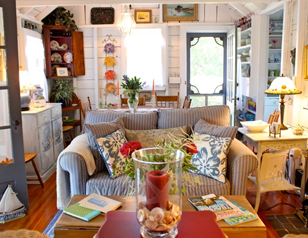 In addition to these amenities, each cottage has its own distinct personality and features. The Cottage on the Pond is a peaceful and private refuge, hidden away from the busy summer streets of Rockport. Guests also have a good view of the nearby pond from the back yard. The three bedrooms of the Cottage on the Lane are located on the upper floor to provide views of the dazzling Atlantic seascape. Visiting in the summer lets you enjoy the cottage's spacious back yard and barbecue area. The Sound House is the most intimate setting, and guests will fall in love with its antique style and cozy atmosphere. Each of these options is suitable for pets, so feel free to bring dogs and other animals with you. In addition to the enchanting accommodations, staying in a pet friendly rental in Rockport lets you access all of the fun of the town itself. Experience some classic New England culture by visiting the town's art galleries and boutique shops, or take a stroll down the scenic streets to find some fresh seafood. Visitors will not want to miss Bearskin Neck, a trendy shopping destination. You can also take a dip at the beach or one of Cape Ann's numerous swimming holes. For more information on the Cottages at Rockport, contact us at (978) 290-4022.